West Lawn, Photo by Rufus Holsinger, ca. 1910. Despite numerous inconveniences, students annually vie for a room on the University's Lawn. Originally only Virginians were eligible to reside in the coveted Lawn and Range rooms but all this changed in 1949 when it was announced that the rooms would be assigned to student leaders--geography notwithstanding. 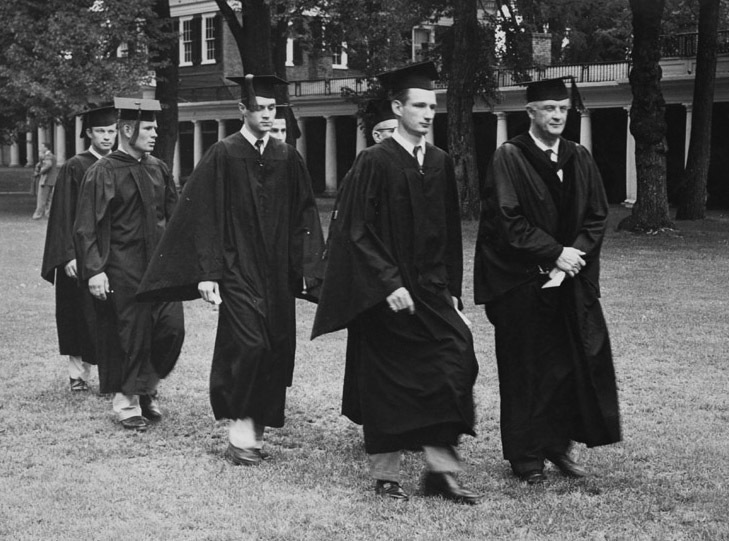 President Colgate Darden "walking the Lawn" at graduation with the officers of the Class of 1954, photo by Ralph Thompson, 1954.